Ideal for use with asphalt & elastomeric roof cements to strengthen repairs on cracks, gutters, flashings, seams and more. CRACKS, BREAKS, LOOSE SEAMS: Clean area of loose dirt and debris. If moisture is present allow area to dry. Apply roof cement to defective area. Extend coating to three inches beyond area to be repaired. Spot stick reinforcing fabric in position over defect. Press into place. Top coat with roofing cement. FLASHINGS: Spread roof cement into cracks extending 3” to each side of crack. Firmly press reinforcing fabric into coating and top coat with more roof cement. GUTTERS: Clean gutter of dirt and rust. Dry area to be patched if wet. Place heavy coating of roof cement over defective area. 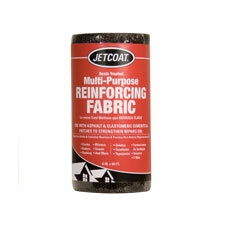 Firmly press reinforcing fabric into coating and top coat with more roof cement. BLISTERS: Leaking blisters should be slit in a criss-cross pattern and folded open. Damaged materials should be removed. Allow area to dry if wet. Apply roof cement to opened area with putty knife or trowel. Replace criss-cross cut material to close opening. Press into place. Cover area with roof cement. Extend coating 3” beyond defective area. Firmly press reinforcing fabric into coating and top coat with more roof cement. 61762S 6 in. X 50 ft. Roll .46 lbs.